This knife was designed for many applications. It can be carried in a pocket, on a key chain, or as a money clip. The name “Ridge™” is due to the machined ridge in the handle to protect the user from the blade edge and tip of the knife when closed. The patented Mid-Frame lock is similar to the popular Liner Lock, but unlike its competitor, is harder to release by accident because the handle frame wraps completely around. 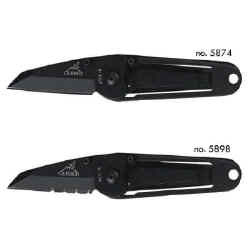 This version features a serrated edge blade. All the components are coated with black Teflon®. This protects the stainless steel from corrosion and also provides a non-reflective surface.